Combining the best of all the fish finders and bringing it together in one simple and easy to use system is one of the toughest things anyone could do when it comes to marine technology. When this is done, the price is quite expensive and we end up with a slow system that might even be much more frustrating than helpful to the average angler. The Lowrance HDS-12 Gen3 revolutionizes the way we look at fish finders and by taking all of the top features of previous models and combining them together in a device with a 12-inch screen that can easily be operated takes some doing. The Lowrance HDS-12 might seem quite expensive, but thanks to the revolutionary design and technology, it might end up being worth the price. Fishing Tech happily gives the Lowrance HDS-12 an overall rating of A+. 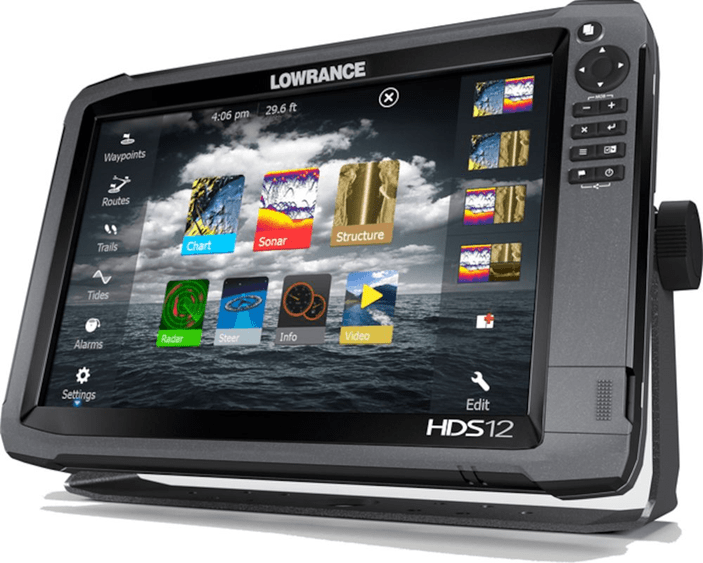 The Lowrance HDS-12 Gen3 features a large 12-inch LCD LED backlit display system that can be operated using the touchscreen or the navigational buttons found on the side. It features a 1280 x 800-pixel screen resolution and the backlight can also be toggled on and off to compensate for night fishing or the glare of the sun. It comes with a display ratio of 16:9 and makes use of fishing icons instead of arches to show users the fish once they have been spotted. This fish finder includes the famous Lowrance Multi-window function that has always been a staple in some of the older and smaller fish finder models. It allows the user to keep viewing the sonar, while looking at other stats like the water temperature if needed. When you pay this much for a fish finder, you will certainly be hoping for the best in terms of the sonar and the transducer. The Lowrance HDS-12 features the Lowrance TotalScan transducer, enabling users to use the StructureScan feature. The standard CHIRP sonar is also included and this work on a frequency of 83/200 kHz, while the StructureScan feature operates on a frequency of 455/800 kHz. It features a maximum depth range of 750-feet and this can be used in saltwater as well, but with the StructureScan feature, users will have a 180-degree view of what is going on underneath the boat. The TotalScan transducer is functional in all weather condition, making ice fishing possible. Nevertheless, it is worth mentioning that the fish finder can be purchased without this transducer as well. The Lowrance HDS-12 Gen3 comes with Insight USA charts and maps that have already been loaded. These maps contain the most common fishing locations in and around the US coastal areas, but can also be upgraded if needed. It includes a powerful antenna for calculating your position and users are enabled to plot up to 200 routes with 5000 waypoints. These locations can all be viewed in 2D if needed and the logs from the StructureScan feature can also be overlaid with maps to make it that much easier to find the right fishing spots. The Insight Genesis feature also enables the user to create their very own custom maps of their favorite fishing locations and hotspots. While all the important features are included, this fish finder still includes Wi-Fi connectivity that makes it possible to download new maps and share your favorite hotspots with other users on the GoFree app. 2 MicroSD card slots have been included for downloading new maps should the user feel the urge to expand their library. It should also be mentioned that all of these upgrades must be purchased. In terms of the quality, this fish finder is built to last. It might be mainly made from plastic, but it is durable shock resistant. It features a waterproof rating of IPX7, the same you will find in most Lowrance products and this makes it possible to withstand up to 1 meter of water for up to 30-minutes. Unfortunately, the design is quite large and cannot easily be stored in the pocket of your pants when not in use. The TotalScan transducer might be optional, but it is one of the most functional transducers on the market today. It is completely impervious to weather conditions and should work in both cold and warm weather. Should you fish in the dark, the LCD display system features a button, allowing you to turn the backlight on or off. As one of the more expensive fishfinders on the market, it certainly takes a while to find one if you just want to test it. However, this wait is definitely worth it and the fish finder excels when put to the test in the water. The display is clear and easy to read, while it is also constantly displaying a multitude of stats that you might not know what to do with. Advanced Signal Processing has also been carried over and this helps the fish finder be much more efficient at its job. APS allows you to focus on fishing, while the fish finder automatically makes adjustments with the information that has been processed. This makes it much easier for you to spot fish when moving into shallow or colder water areas. There is not much wrong with the mapping system on this fish finder and the Lowrance HDS-12 Gen3 certainly competes with some of the best Garmin has to offer. The antenna is extremely accurate and effective and the addition of the Insight USA maps gives you a decent library to get started with on your first couple of trips. The only real downside is the fact that all of the additional maps must be purchased and this might become rather expensive over time. It is worth noting that the Lowrance HDS-12 Gen3 is compatible with maps like the Navionics and C-MAX MAP-N+. All the other Insight maps can also be used if you feel like expanding the library. The Lowrance HDS-12 Gen3 competes with the HDS-9, but with the larger screen, it is just a little better and easier to use. However, it is still not the biggest Lowrance fish finder and that belongs to the HDS-16 as it comes with all of these features and an incredibly large display system. The HDS-12 is certainly one of the top fish finders designed by Lowrance. While Lowrance is certainly one of the leaders when it comes to fish finders, it does have some competition at that high price range. The Lowrance HDS-9 Gen3 also competes closely with it and while it might be somewhat smaller, it does still have the same features as the HDS-12. The Lowrance HDS-9 Gen3 Fish Finder is one of the top fish finders in its price range. It might just be somewhat smaller than the HDS-12 and only features a screen size of 9-inches, but it certainly does stand out with the same top quality features. If you are working on a strict budget and the HDS-12 is out of your price range, the HDS-9 could be a great option. Our final thoughts on the Lowrance HDS-12 Gen3 is quite high and while the fish finder might be out of the budget of the occasional angler, it is certainly one of the top fish finders for the avid fishing enthusiast. It is quite versatile and can be used from the shore as well. If you are in the position to afford it, we believe this fish finder will be a great lifelong investment and you might never have to buy another fishfinder ever again. Fishing Tech happily gives the Lowrance HDS-12 Gen3 and overall rating of A+ and we would highly recommend it to any avid angler as it can be used for freshwater and saltwater fishing trips.